Here’s a perfect example of what people mean when they use the expression ‘milking it for all it’s worth’. When HIGHLANDER had its original theatrical run it was hailed as an above average action/adventure with a strikingly different visual style and an intriguing premise: what if a secret race of Immortals walked among humankind, waging a hidden war that has gone on throughout the ages, lasting for centuries? A war that would decide the fate of Immortals and Humans alike? If it had been left at just this one movie, the whole concept would have been stronger but there have been a series of really bad sequels, some so-so television spin-offs, including an animated one. All of them violated just about everything that was set up so well in the original movie but even HIGHLANDER is not without some glaring plot holes that virtually guaranteed that any sort of sequel that followed it was doomed to failure. 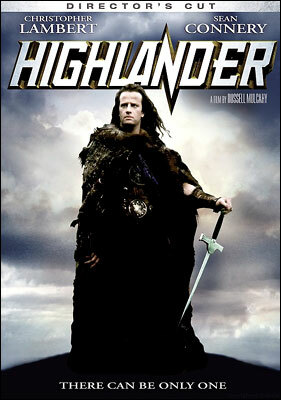 Connor MacLeod (Christopher Lambert) is a warrior living in the Scottish Highlands of 1536. During a battle between rival clans, Connor is viciously attacked by The Kurgan (Clancy Brown) a nightmarishly savage barbarian from Russia whose people entertained themselves by throwing children into pits with wild dogs and watching them fight. The Kurgan delivers to Connor what should have been a deathblow but amazingly, Connor recovers from his mortal wound and the next day is walking around alive and well, his wound miraculously healed. Quite naturally this means he must be in league with Satan so his own people cast him out and he wanders the land until finding love and peace with Heather (Beatie Edney). This peace is disrupted by the appearance of the strutting, dashing swordsman Juan Sanchez Villa Lobos Ramirez (Sean Connery) who reveals Connor’s true nature to him. Like Ramirez, Connor is an Immortal, fated to slay or be slain by other Immortals who must all kill each other until only one is left. And this one will receive ‘The Prize’, some great gift that will change the fate of the world forever. Ramirez trains Connor in swordsmanship and teaches him how to use his Immortal abilities but unfortunately, The Kurgan is also an Immortal and once again disrupts Connor’s life, killing Ramirez and brutalizing Heather. In 1985 New York, Connor lives as an art/antique dealer named Russell Nash and comes to the attention of The NYPD due to the fact that there seems to be a lot of headless bodies showing up whenever he’s around and in particular to police forensic scientist/ancient weapons expert Brenda Wyatt (Roxanne Hart) Brenda finds metal shavings at a crime scene near a headless body that she’s convinced came from a samurai sword that was made two thousand years before the first recorded katana and she’s even more convinced that the mysterious Russell Nash knows about the sword. Well, of course he does. But he can’t very well tell her that he’s going around defending himself from attacks by his fellow Immortals by cutting of their heads, which is the only way to kill an Immortal with the sword he inherited from his mentor Ramirez. But she soon finds out the truth as The Kurgan is also in New York and at last after centuries of Immortals slaying each other it has come down to just The Highlander and The Kurgan, who is holding Brenda as a hostage to gain an edge on Connor…. and There Can Be Only One…you just knew I was going to work that in somewhere, didn’t you? When it comes to the look and visual style of the movie, it still holds up really well. Russell Mulcahy had directed plenty of videos before HIGHLANDER and he made a horror film called “Razorback” which is about a giant wild razorback pig terrorizing the Australian outback. Trust me; the movie is a lot better than it sounds. Mulcahy brought the visual techniques he used in his videos to HIGHLANDER and they’ve been copied so often since then that we see them and yawn but back in 1986 this was really exciting stuff. Even today many of the shots are breathtaking, such as the opening shot of a crowd in Madison Square Garden that dives and swoops like an eagle trapped inside the building until the camera zooms in on Lambert. The scenes set in 16th Century Scotland are astonishingly beautiful as well and provide a nice contrast to the concrete cliffs of 20th Century New York. The fight scenes are beautiful, brutal and bloody as all good movie fight scenes should be. But it’s after the movie is over and you sit back and think about it you realize that HIGHLANDER is a lot like a politician’s campaign speeches: There’s a lot of talking but not a damn thing has been said. I’m kinda disappointed that we’re presented with a race of Immortals who instead of working together toward a common goal spend their time running around hacking off each other’s heads. We’re given tantalizing glimpses into what surely must be a fascinating culture, but that’s all we’re given. It’s never explained why The Immortals have to kill each other off or how they found out that the only way to kill an Immortal is to cut his head off (seems like a secret I’d keep to my own damn self) or why they never fight on holy ground. And if the whole point is for Immortals to kill themselves to get ‘The Prize’ then why does Ramirez train Connor instead of taking his head? Do Immortals age naturally until they reach a certain age? It would explain why Connor, The Kurgan, Ramirez and the couple of other Immortals we see in the movie are all obviously different ages but this is never explored. How did The Immortals learn about ‘The Prize’? Who told them? However, HIGHLANDER has three big things going for it: Sean Connery, who steals every scene he’s in as Ramirez who even though he has a Spanish name is actually a two thousand-year-old Egyptian. Christopher Lambert who I really like as an actor. He can be badass, cool, charming and goofy all in the same scene and make it believable. He’s got a strong scene where he’s comforting his dying wife Heather who has grown old while he has stayed young and strong and it’s a very touching moment where Lambert effectively captures the pain of what being an Immortal must be like. Clancy Brown is terrific as The Kurgan and plays him as an unstoppable killing machine with a grisly and totally inappropriate sense of black humor. He’s one of the best movie bad guys ever. So should you see HIGHLANDER? Sure. It’s perfectly entertaining high adventure that’s got a fun story, interesting characters, a great music score, some good fight scenes and despite what I think are plot holes big enough to fall into, you can ignore ‘em and just have a good time. It’s not a demanding movie by any stretch but it is what it is and that’s more than enough. Enjoy with my blessings. Loved the movie when I first saw it at the theater and loved it still when I got the Blueray. The cinematography was amazing, is still amazing. I did think it kind of funny that Lambert, a French guy, played a Scottish guy while Connery, a Scotsman, played an Egyptian. And this was soon after Lambert played Lord Greystoke, and English guy. Has he ever played a Frenchman? Great movie, and established Lambert as an action star. There is a throwaway scene where the required minority Immortal shows up. He and the Highlander are old( what else) friends and yuk it up about a duel Connor had in the 18th Century with an increasingly befuddled mortal. The Kurgan butchers the memory bringer ( of course). But it left me asking, was he a free manservant of African origin, a slave, and if that, why would he go throw that experience when he could have slaughtered… It’s an okay live action cartoon.